Earthworm farms come in all shapes and sizes as a result of our endeavours to create ergonomic systems that satisfy the requirements of earthworms and our production results. I have used natural and recycled materials. Earthworm Farm: straw bales are a construction I use for large scale earthworm farming. It is an outdoor system open to the elements. Useful for homogenous feedstock and for producing castings. Earthworm Farm: baths are a side to side production method for harvesting vermicompost, leachate and earthworms. I use this system for mixed feedstock as I can make use of scarcer useful compost ingredients such as coffee grounds, comfrey, elderberry and grape skins, which I mix with garden clippings, crushed thatch and some manure. Earthworm Farm: Tyre stacks are a great way to recycle tyres. A top feeding system from which I harvest castings. I am using them to recycle organic waste from our Hermanus Montessori School as a component of the Eco Schools Project. 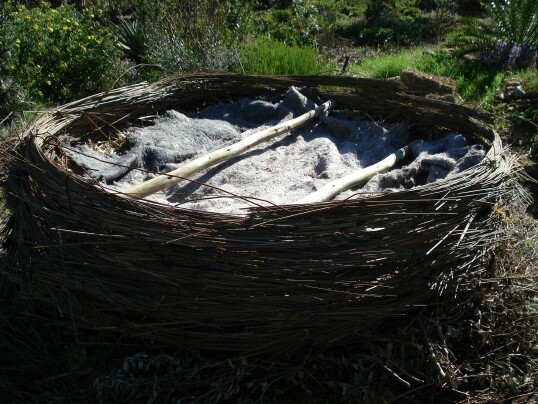 Earthworm Farm: woven thatch is a new system constructed on an established compost heap to harvest earthworms and produce earthworm enriched vermicompost. I use a mixed feedstock of manure straw and vegetable garden waste.